What appeared like a weak monsoon turned into full throttle days of rains for past two weeks. The weather has turned pleasant with cool breeze and I am enjoying my days in the kitchen. What a relief from the sultry heat! Such days inspire one in the kitchen, days when the mundane needs to take a back seat or mundane needs to be transformed into something splendid. It was on one such day last week when I was planning to make besan ka chila for the breakfast when Socca just popped up, out of the recesses of my memory. I learnt about the Socca from a friend while on our trip to Europe. We were discussing about the street foods of India with him when he mentioned the Socca, a popular street food in Southern France. From his description I was convinced that it was a long lost cousin of our own desi besan chila. We tried to locate a place where we might find it in Paris but could not; apparently one needs to visit southern France to enjoy this delicious snack but visiting that part of France was not on our itinerary. A hunt for the recipe lead me to David Lebovitz blog and I realised that it was indeed a close cousin of besan chila; only this one is cooked on high heat (broiled). I tried the socca in a skillet over gas stove and in a pan under the broiler. The broiler one is definitely better – crisp on the edges and chewy in the centre. I wouldn’t call my recipe an authentic Socca coz I have tweaked it a lot and by a lot I mean a lot. 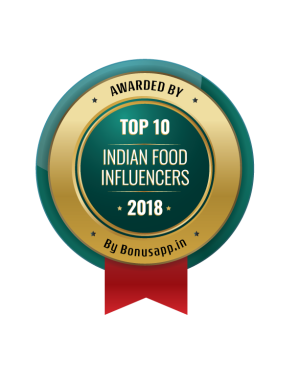 I have tried to build a recipe to cater to the taste of my family since their Indian palate is so used to piquant flavours of Indian curries; that’s why the name of this post – cheat’s recipe. My apologies to the purists but I really couldn’t help it! In fact I have taken it a step further and turned the simple socca into a pancake smeared with a mint & Bengal gram chutney and garnished with cottage cheese, mint leaves, cherry tomatoes and pickled onions. A dusting of roasted and ground cumin powder over the top and it turned in to a heavenly gluten frees ‘pizza’ (of sorts)! It was after I entered the world of food blogging that I heard and understood the term gluten. Till then I couldn’t imagine someone being intolerant/ allergic to wheat or stuff like that. I am a north Indian and for me wheat is like a staple diet and I can’t imagine life without it. In fact in one of my initial posts, it was Balvinder who told me that I had posted gluten free recipe! But thanks to so many food bloggers who dedicate posts to gluten free diet and certain others only write and blog about gluten free food. Balvinder’s blog Simply Gluten Free Kitchen happens to be one of them. I am sure it must be of great help to those who have intolerance to gluten. For chutney, put everything together in mixer-grinder and blitz. Keep the chutney aside. Take the chick pea flour and add salt, coriander powder, salt, red chili powder, ginger and garlic paste. Add water, fruit salt & one to one and half table spoon oil and mix everything well together. (I beat the batter for a while.) Set aside the batter for at least one hour. Pre-heat the oven at 200-210 degree C. Take a tart pan (I used a 7 inch one) and heat it in the oven. When it becomes hot, add 1-2 tsp oil and pour a ladle full of the chick pea flour batter and swirl it around so the bottom of the pan is covered well. Return the pan in the oven and bake till it gets cooked (12-15 mins approx). Now switch on only the top grill of the oven and increase the temp to 250 degrees C. Keep the pan 4-5 inch away from grill and cook further for 5-8 minutes or till the top turns golden brown and edges crisp. I believe the tip to cook will vary so please keep an eye on the socca. Remove from the pan and spread the chutney over the top of the socca (the amount depends on personal preference). Now, grate the cottage cheese over the top. Garnish with mint leaves, sliced tomatoes and onion slices. Sprinkle some cumin powder and serve immediately. The hot socca was an absolute bliss on the cool rainy day with piping hot cup of tea. So do try it! In fact I wasn’t aware of gluten free. My body can absorb anything (so far so good) and just like you, it was Bal’s blog. Its a lovely twist and I adore the role of spices into these pizza pieces. But I have to say that we are into rice and noodles that making pizza has never been part of what I cook. Yet I think its a good meal especially this delicious version. Although rice and wheat are the staple cereals in my family, we love dishes made from chickpea flour. Hence this gluten free pizza. 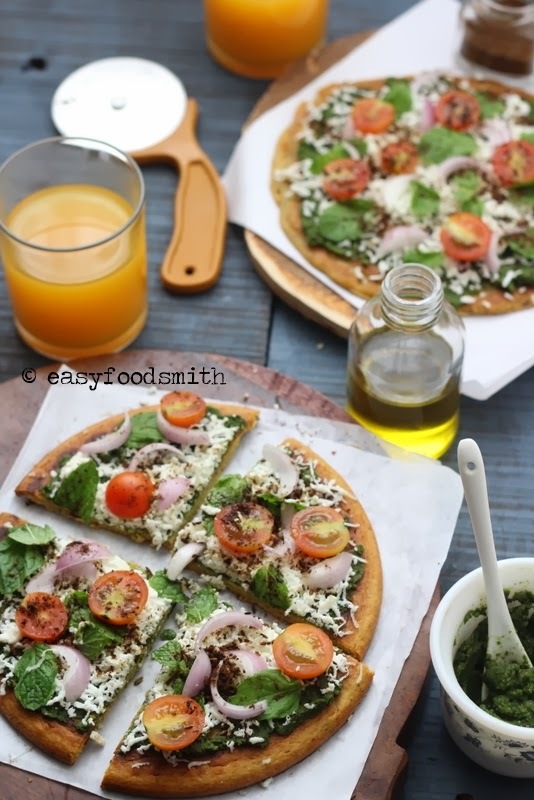 Chickpea pancake instead of wheat crust…your pizza looks divine! Thanks Angie…it even tasted divine! That is such a fabulous idea and wonderful recipe! I am a big fan of socca and pizza. Terrific! It was my first socca and I am a fan too now! Delicious looking pizza, sounds so yummy. This recipe is so enticing – I love pizza with anything green on it as it gives the illusion that I am eating something healthy – but this recipe actually is! So sorry you’ve had such horrid weather. The pizza looks and sounds wonderful – Love the flavoring and great use of “alternative” flours! This looks wonderful + I love that you tweaked it to make the flavors more suitable to your family’s preferences. It sounds SO good to me! You bet! It is hard not to polish off the whole thing! Like Sashi said, never heard of Socca but besan chila is definitely something I’ve heard and love. This looks so good and what a great combination. Had it not been for a holiday in France, I too would have never learnt of this wonderful snack. Wow, I really love how well documented your posts are :). And the pictures are to drool for. I had never heard of socca till it came up as one of our French Fridays with Dorie assignments. It was so easy and tasty. But yours is so much prettier…all dressed up as a pizza. Love it! Thanks Liz. I found socca to be addictive! 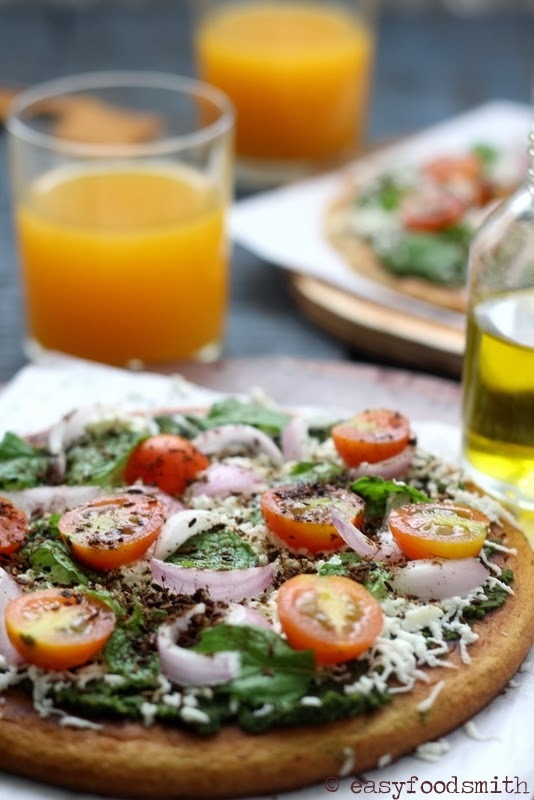 I like the idea of using chickpea flour for the pizza dough…looks delicious! Absolutely Juliana. It was delicious and oh so guilt free! Super delicioso su pizza totalmente bueno,bonito y saludable,saludos y abrazos. What a gorgeous pizza! Poor you with all that rain!! Have a great week, this week! 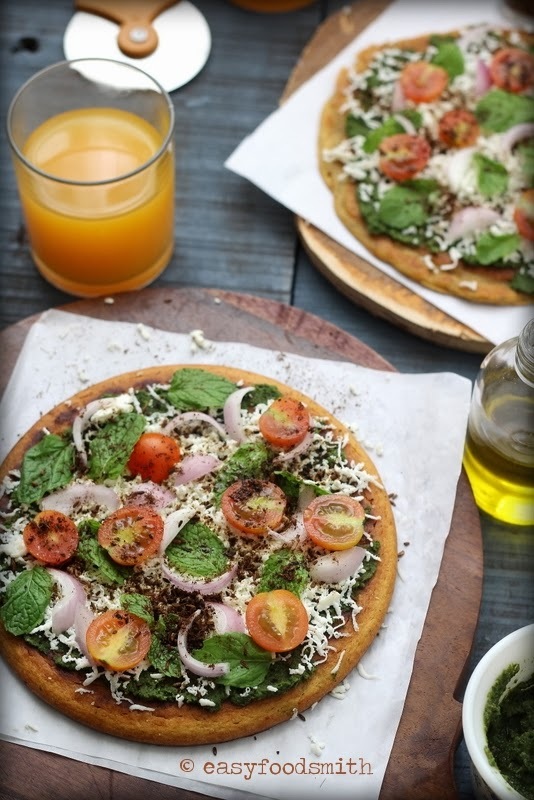 Besan chilla is one of my fav.I even tricked my girl the other day by topping it like pizza but never knew there is really something like that.Ok now I know:)Socca looks so colorful and yummy! Although, it appears to be besan ka chila but the way to cook it is very different from the chila and thats what makes socca really different from a chila. Wow..talk about a culinary journey! I loved tracing your thoughts from beginning to end on this one….and the end result is pretty spectacular! I’ve never heard of socca before, but this sounds so healthy & delicious. Lovely creation! The chickpea base does make this pizza base a healthy one. i have made socca a couple of times. i went with the authenticity and baked these in the oven. i preferred them much much over the besan chillas. but i did serve them with mint-coriander chutney. your pics are really good and they way you have presented is too good. Oh isn’t it amazing Dassana! I am now finding myself hooked to it especially since it is raining most of the time here in Mumbai. Thanks Nancy. I too find myself having fallen in love with it. Rightly said Kiran. There is endless treasure of food diversity across the world. What a lovely and colorful pizza. We’re pizza fans in our house, so this recipe would make the whole family happy campers. That’s a fantastic looking pizza! I’ll have to make this for my good friend who loves pizza but rarely gets to eat any. Oooh.. I have yet to make homemade pizza from scratch. Looks delish. Love besan chila but adopting the same as a pizza base is one brilliant idea. So colorful ! And yes, I have not heard of socca too before . Socca is eaten here, argentina, together with regular pizza. Yes, weird, but it´s been around forever, our italian heritage which brought a lot of italian bakers. Now, I like to use it as a pizza dough. But should take your hint and make it wonderfully spicy too! Certain recipes have uncanny similarity across cultures. What a great looking pizza. 🙂 I love your topping selections too. So refreshing and decadent at the same time. This really looks amazing. 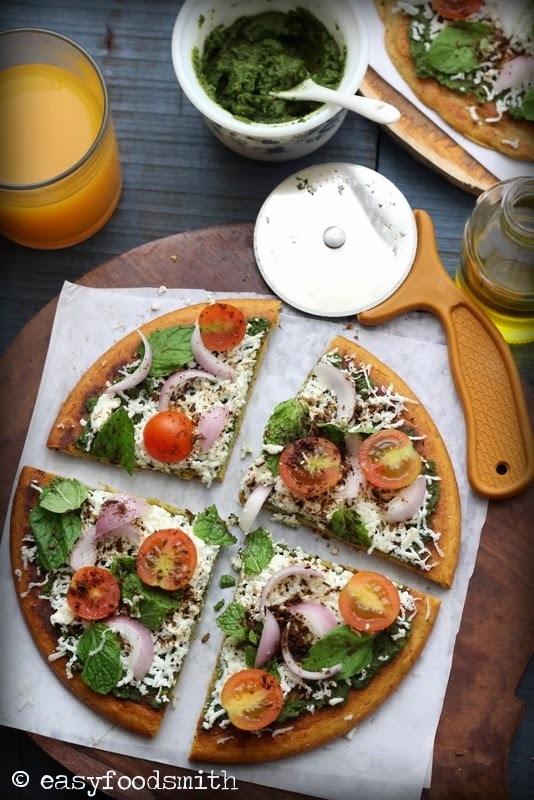 It is only the second time I see a Socca recipe..got to try it…and I love how you turned it into a pizza, especially with the Mint Chutney!